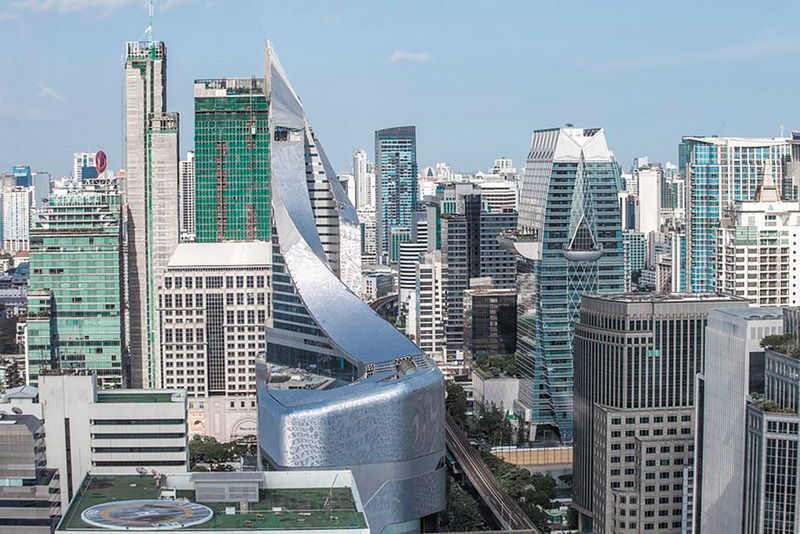 Located within the former gardens of the British Embassy, along Ploenchit Road, Bangkok’s primary commercial artery, the 140 000 sq. m. mixed use project merges a seven storey luxury retail podium and a 27 storey five star Park Hyatt hotel tower into a cohesive, architectural entity. The hotel and shopping mall are bound together using the notion of a continual looped form to give a more intuitive merging between plinth and tower and between the programs. The continuity of the tower line appears to break down the volume of the mass of the plinth, creating a structure that is asymmetrical in all dimensions. The openness of the form embraces the city and sets up reciprocal views, with a series of terraces outside and balconies within to see and be seen. The elevated form that rises from the podium wraps around two vertical light wells, opening up internal spaces to reveal stepped terraces, and dividing hotel functions. Uniting traditional craftsmanship with digital design technologies, the design of the façade builds on Thailand’s tradition of intricate pattern making. The building’s 300,000 aluminum tiles, each have two surfaces to reflect both the chaos of the city and the sky itself. Creating a dynamic pattern in response to external conditions, the distribution of tiles creates a moiré-like effect, articulated by the play of light and reflection along the varying profiles. The tower is the first to be completed by a British architect in Thailand.